At Davitt Electric of our Bentonville electrician is licensed and fully trained in the latest techniques and up-to-date electrical code. Our Bentonville electricians are truly professionals because they stay up-to-date and trained in their craft. We guarantee that you will never be dissatisfied with our service. We have great customer service and low pricing. We are able to keep our pricing low by keeping our overhead and costs low. We are not like the big electrical companies, we have the same quality of work, but with that small business feel. Our owner Joe Davitt will always be made available to our customers. Owner Joe Davitt, has been been a master electrician in the Northwest Arkansas area for over 10 years. Joe Davitt is not only extremely well-experience Bentonville electrician, but he is also licensed with a master electrician license and carries top of the line insurance. When you hire Davitt Electric, you will always get upfront pricing, quality service, efficient and timely service and a customer service policy to always keep the customer happy. We believe in giving the customer FULL value for their money. We provide a 100% guarantee. This means if you are not happy with the service provide, we will keep coming out their until the problem is resolved. Our Bentonville electricians put an emphasis and focus on getting the job done right the first time. No job is too small! Every job is just as important as the next. David Electric also provides other services such as panel upgrades, helping your with your insurance claim repairs, landscape and security lighting, whole home wiring, backup generator systems, fire and smoke detector installations, hot tub and spa hookups and more. We also provide 24 hour emergency service in Bentonville. At Davitt Electric, we can help you with all of your electrical wiring needs. Whether you need wire ran for a single electrical outlet, wiring for a new circuit-breaker box, an electrical appliance connection or entirely new wiring throughout your Bentonville home, we have you covered. Home automation encompasses all lights and Electrical components both inside and outside your Bentonville home. Davitt Electric provides home automation Electrical services and can customized a system for your particular needs. When home automation is designed and installed properly it will conserve energy, add value and streamline function to your Bentonville home. Home automation allows you to set the mood for dinner, pre-heat your steam shower or spa, or check you security system from practically anywhere in your house. Our professional Bentonville home automation electricians understand that home automation installation success depends on what it will allow you to do in the future. Our systems can be expanded easily and integrate well with security and media applications. 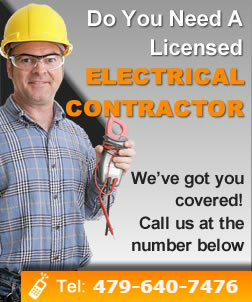 If you are looking for a Bentonville electrician then please call 479-640-7476.